First Edition, First State with a EARLY SIGNED PAGE WITH A DRAWING by Roald Dahl. A stunning near fine example with the requisite bound by H. Wolff, located on the last page in the About The Author Section. Beautiful First state dust jacket with a near fine clean book. Accompanied by a large signed sheet with with a drawing by Roald Dahl of an Owl and his jocular autograph, signed and dated of 18 May 1970, This is my 205th autograph Today /Roald Dahl, and then additionally Dahl notes under the Owl Whoo. An absolute classic autograph by Dahl! JACKET JAMES AND THE GIANT PEACH ROALD DAHL. JAMES AND THE GIANT PEACH. 1ST STATE, 1ST/1ST PRINTING SIGNED BY ROALD DAHL WITH A DRAWING. Accompanied by a large signed sheet with with a drawing by Roald Dahl of an Owl and his jocular autograph, signed and dated of 18 May 1970, This is my 205th autograph Today /Roald Dahl , and then additionally Dahl notes under the Owl Whoo. The book has crisp red cloth boards with an embossed image of a wreath and the head of a child to front. Unfaded Gilt titles to spine. The boards are in stunning condition with deep red cloth, sharp corners and no edgewear. The binding is tight and square. The end papers are perfect condition with no bookstore stamps, no owner names, no inscriptions and no bookplates. Beautiful clean, bright copy of a childrens book in hard to find condition, appearing as unread! Accompanied by a extremely unique autographed page, dated 1970, which most likely was signed during a signing event in Dahls classic dry humor of 18 May 1970, This is my 205th autograph Today /Roald Dahl and under the Owl Whoo. With small notes in pencil to the page describing the background of the recipient. The stunning original first edition, first state dust jacket is in beautiful condition having benefited from very slight restoration to the spine and corner outer tips by an expert paper conservator and as such presents in near fine condition. The jacket has strong, bright vibrant colors still retaining the strong red/orange tones to the spine (which is most unusual as this title is usually found with faded spines). The jacket has no edgewear, no stains, no rips, no chips, no rubbing, no fading and no foxing. A remarkable, clean, crisp exceptional example of this title, with a very early signature and drawing by Roald Dahl! Outstanding presentation with the near fine dust jacket. 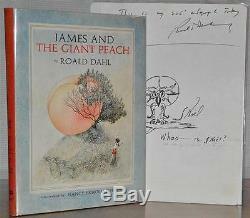 The item "SIGNED 1ST/1ST EDITION W. JACKET JAMES AND THE GIANT PEACH ROALD DAHL" is in sale since Monday, April 10, 2017. This item is in the category "Books\Antiquarian & Collectible". The seller is "iwc_2004" and is located in New Canaan, Connecticut. This item can be shipped to United States, all countries in Europe, all countries in continental Asia, Canada, Australia.